Jeffery M. Sharp serves as The Smeal College’s Associate Dean for International Programs. His responsible areas include Smeal’s faculty led study abroad programs, the study abroad advising directors, serving as the college’s liaison to the university’s Office of Global Programs and coordinating with the university’s partner programs in other nations. From 2013 to 2017, he served five graduating classes as Smeal's Associate Dean for Undergraduate Education. 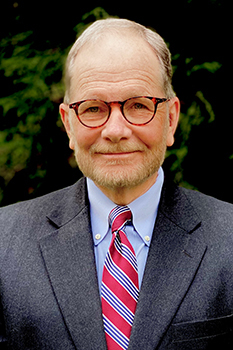 Associate Dean Sharp has published numerous articles and papers on business law subjects, including bankruptcy, commercial transactions, property rights, environmental law, and banking. His research on the impact of the Digital Millennium Copyright Act on the educational community was named the 2002-2003 winner of the Ralph C. Hoeber Award by the Academy of Legal Studies in Business. In 2013, he became the second Smeal College faculty member to receive the university’s highest overall teaching award, being named a Penn State Teaching Fellow. With a career committed to teaching excellence, he has been recognized by the university, the Smeal College and his research academy colleagues with awards that include the 2003 Milton S. Eisenhower Award for Distinguished Teaching; Master Teacher by the Academy of Legal Studies in Business (2003); the Smeal College’s annual Fred Brand Award for Outstanding Teaching (1992, 2000, 2006) and named a Paiste Teaching and Learning Fellow in 2011. Digital Copyrights. Property Rights. Debtor-Creditor Relations (including Bankruptcy). Environmental Law. All articles of the Uniform Commercial Code, banking relationships, debtor- creditor law, and bankruptcy law. B LAW 444B LAW 444 Advanced UCC and Commercial Transactions (3) This course is designed to: (1) provide the student with a systematic study of the laws governing sales transactions, the instruments for financing those transactions and rights and liabilities of debtors and creditors (the Uniform Commercial Code governs these issues); (2) to explore current trends in the law affecting commercial transactions; (3) to develop further the student’s legal reasoning processes; (4) to enhance the student's ability to identify legal issues from the business decision maker’s and financial auditor’s perspectives. Instructional methods will include lectures, readings, multimedia content, and class discussions. Student progress and mastery of the material will be evaluated through periodic examinations. Some state C.P.A. Boards require completion of this course as a prerequisite to obtaining certification as a public accountant. Completion of the course will be credited toward fulfillment of the requirements for the Legal Environment of Business Minor. Examines the interplay between enviornmental regulation and commercial activities, including property interests. All articles of the Uniform Commercial Code, banking relationships, debtor- creditor law, and bankruptcy law. Examines the impacts of major federal environmental laws on business relations and property interests. Examines the impacts of major federal environmental laws on business relationsand property interests. Bailments, shipments, and sales of goods; financing transactions and creditors' rights; commercial paper. This article was selected The 2003 Hoeber Memorial Award for the Outstanding Article in the ALBJ, the ALSB’s highest research honor..
Sharp J. M., Rails-to-Trails, Rational Governments, and a Constitutional Shortcut: The Perils of Preseault, vol. Vol. 29, no. 4, 2001, pp. 229-321. Sharp J. M., "Digest of Selected Articles." vol. Vol. 29, 2001, pp. pp. 269-276. Sharp J. M., "Digest of Selected Articles." vol. Vol. 29, 2000, pp. pp. 160-169. Sharp J. M., "Digest of Selected Articles." vol. Vol. 28, 2000, pp. pp. 368-375. Sharp J. M., "Digest of Selected Articles." vol. Vol. 28, 2000, pp. pp. 270-282. Sharp J. M., "Digest of Selected Articles." vol. Vol. 29, 2000, pp. pp. 82-91. Sharp J. M., ""Rails to Trails" and the Ghosts of Railroads Past: The Preseault Microcosm." vol. Vol. 28, 1999, pp. pp. 263-276. Sharp J. M., "Digest of Selected Articles." vol. Vol. 28, 1999, pp. pp. 184-188. Sharp J. M., "America Becoming "The Beautiful" Again: Examining a Century of Aesthetic Regulation." vol. Vol.27, 1998, pp. pp. 165-184. Sharp J. M., Property, Commerce, and the Natural Environment-An American Legal Journey, (J.S.C Publishing), 1997. Sharp J. M., "Reinterpreting Lenders' Environmental Liability: Congress Wounds the Creature from the Black Lagoon." vol. Vol. 26, 1997, pp. pp. 375-393. Sharp J. M., "Condemnation Decisions-Survey 1996-1997." 1997, pp. 38 pages, Invited. Sharp J. M., Brown R. J., "The Emerging Fourth Wave of Aesthetic Regulation: Beauty Is in the Pocketbook of the Beholder." vol. Vol. 25, 1996, pp. pp. 327-351. Byrne J. J., Densmore D. W., Sharp J. M., Of Politics, Principles, and Money: How Environmental Lender Liability Changed the Leopards' Spots, vol. Vol. 25, no. 1, 1996, pp. 56-77. Entered into The Smeal College of Business Administration Working Paper Series in Real Estate, No. 94-14. Sharp J. M., "Of Politics, Principles, and Money: How Environmental Lender Liability Changed the Leopards' Spots." vol. Vol.24, 1995, pp. pp. 327-351. Sharp J. M., Environmental Lender Liability: Evaluating Risks Facing Residential Lenders under Common Law Theories, vol. Vol. 23, no. 3, 1995. Sharp J. M., "Examining the Meaning of the Bankruptcy Code's "Reasonably Equivalent Value" Standard in the Context of Mortgage Foreclosures." 1994, pp. pp. 142-166. Sharp J. M., Jaffe A. J., "Residential Lenders as Vendors of Environmentally-Tainted Properties: Employing Economic Theories in Assigning Liability." vol. Vol. 23, 1994, pp. pp. 319-338. Article recognized by the National Law Journal in its Worth Reading column (April 17, 1995). Sharp J. M., "The New E.P.A Lender Liability Rule: A Partial Solution." Uniform Commercial Code Law Journal, vol. Vol. 25, 1993, pp. pp. 224-239. Sharp J. M., Byrnes J., Deal J. C., Densmore D. W., "Report of the Task Force on the Federal Regulatory Burdens and Penalties." 1993, pp. 75 pp., Invited. Henszey B. N., Myers B. L., Bagby J. W., Sharp J. M., "Introduction to Basic Legal Principles." (Kendall/Hunt), 1992, pp. 114-174. Sharp J. M., "Extending the FDIC's "Super Powers" to Its Transferees: A Vehicle for Privatizing Loss Recovery." Commercial Law Journal, vol. Vol. 97, 1992, pp. pp.46-69. Examines motor carrier bankruptcies in the 1980's. Henszey B. N., Myers B. L., Phalan R. T., Bagby J. W., Sharp J. M., Introduction to Basic Legal Principles, (Kendall/Hunt), 1991, pp. 603-880. Sharp J. M., "Bankruptcy Reorganizations, Section 1129, and the New Capital Quagmire: A Call for Congressional Response." American Business Law Journal, vol. Vol. 28, 1991, pp. pp. 525-565. Sharp J. M., Novack R. A., "Purchasing Hazardous Waste Transportation Service: Federal Legal Considerations." Transportation Journal, vol. Vol. 31, 1991, pp. pp. 4-14. Sharp J. M., Anderson M. A., "Liability Risks and Planning COnsiderations For Hazardous Materials Generators and Transporters: Evaluating the Federal Arsenal." 1990, Invited. Sharp J. M., "Private Party Enforcementof Promissory Notes Purchased From the FDIC: Regulatory Power for Sale." vol. Vol.19, 1990. Sharp J. M., Anderson M. A., "Environmental Law: Liability COncerns for Lenders." 1989, Invited. Sharp J. M., "Mortgage Foreclosures and Related Problems: Environmental Concerns for the Lender." 1989, Invited. Sharp J. M., "Representing Creditors and Debtors in Commercial Transactions: Issues Raised by the Troubled Loan." 1987, Invited. Sharp J. M., "Attacking Joint Tenancy Porperty In Oklahoma Based on the Debt of One Joint Tenant." Oklahoma Bar Journal, vol. Vol. 54, 1983, pp. pp. 3021-3029.